3 Steps for Overcoming Fears – Instantly | I Don't Stink! This week I am focusing my Daily Positive Points emails to be on overcoming fears so I thought it would be a good idea to post a few ways to eliminate them. These techniques worked for me and might offer you some ideas to help eliminate yours. Step 1: Focus on What you Want & Why– When I was younger and just starting to work on self improvement, I decided I was going to conquer my lifelong fear of bridges. Without going into where and when it started, all I can say is that it was an extremely powerful fear over my life. For years and years I avoided them at all cost in the car and NEVER, EVER would I attempt to cross by foot. I knew I needed to do something about it so on a business trip to New Orleans, I saw an exit to the Lake Pontchartrain Causeway bridge. Yea, that one. 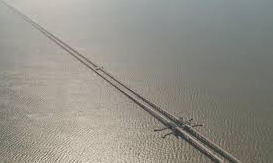 You know, the longest bridge in the world over water. I will post an article on that event later this week on my blog but the bottom line was that I failed miserably. I also put other people at risk for my unprepared attempt to eliminate that fear. Before you start to attempt to overcome a fear, focus one what you want to accomplish and why. Don’t just jump into it without proper preparation. They come in steps 2 & 3 below. Step 2: Visualize a Positive Outcome – Before embarking upon eliminate one of your fears, take a few minutes beforehand to visualize the outcome you desire. Actually, take as much time as you need to actually see in your mind’s eye overcoming the result. This would have worked for me by visualizing me with my fists in the air at the other end of the bridge screaming out, “YES!” If we can’t even visualize it, you can be that we cannot do it. So spend the necessary preparation ahead of time to visualize success. P.S. This techniques works at school, preparing for the standardized tests, work, and anytime you want to achieve a goal. Step 3: Take Action, Stay Focused, & Celebrate the Success – Now that you have prepared the mind, the time has come to take action and face the fear head on. Don’t focus on your nervousness, that will go away AS LONG AS you stay focused on the outcome. Keep seeing in your mind’s eye the ultimate goal and success. When you achieve the success, it is important to celebrate. Overcoming fears is one of the most powerful tools we have to create an amazing life. However, please do not worry if you did not face the fear with a success today, make up your mind to face it again when you are ready. These techniques worked for me and maybe they will work for you. Just remember that jumping into eliminating a fear without the proper prep can be dangerous. Even though I did eventually get to the other side of the bridge that day, it was absolutely one of the worst experiences I have ever had. I also put others in danger in the process. Don’t hesitate to seek guidance from counselors to help guide you to eliminate your deepest fears too.